Infinite Monkey Theorem | Leah Palmer Preiss ~ Curious Art: Acrylic painting on text collage on canvas, 6"x6"
Infinite Monkey Acrylic painting on text collage on canvas, 6"x6"
This particular monkey is available in my Etsy shop, & also makes a fitting companion to last year’s Counting Sheep! 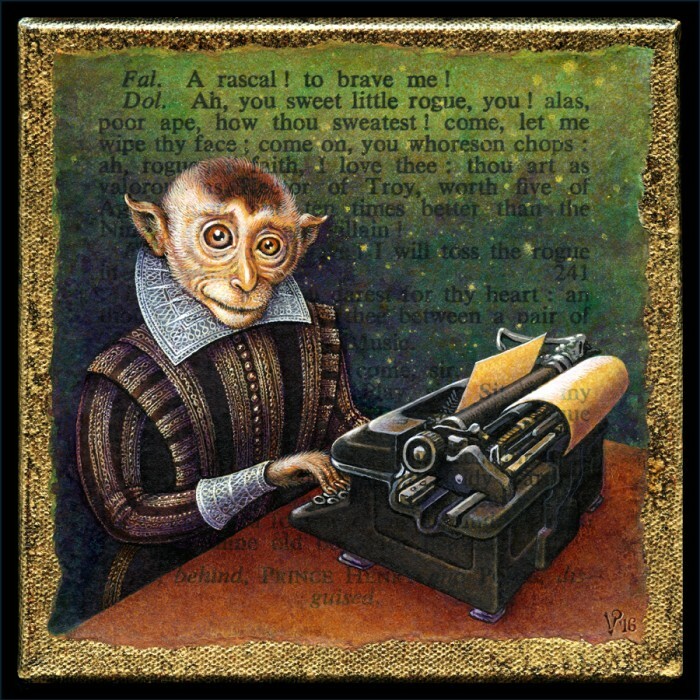 By the way, the typewriter in this painting was modeled on one that came with our house (which was built in 1927.) One of the many reasons I knew it was the right house for us! This entry was posted in Paintings, Prints Available, Uncategorized and tagged Acrylic, Art, Collage, Etsy, Infinite Monkey Theorem, Leah Palmer Preiss, Monkey, Painting, Shakespeare, Typewriter on 1February 2016 by Leah.